A week of events kicks off September 22nd to promote and celebrate active living after retirement. Richmond’s own Senior Connections, Capital Area Agency on Aging, Arthritis Foundation, and VCU Department of Gerontology are jointly hosting and coordinating all the work and at Active RVA, we’re glad to be participating. The calendar for the week is extensive. Pickle Ball. An art show. Workshops. Yoga. Even cooking lessons. 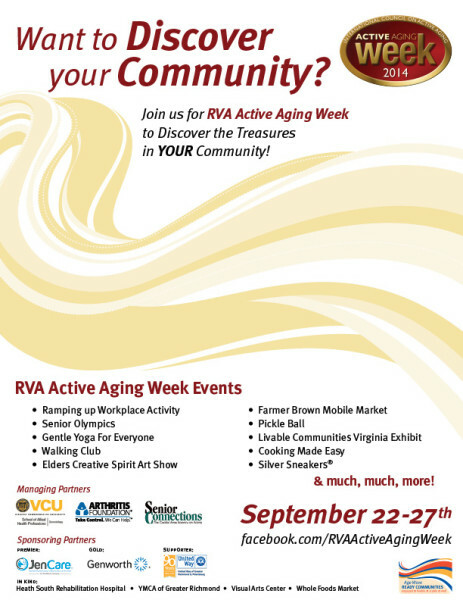 The team putting on Active Aging Week here in RVA have activities set to begin in the City of Richmond and the Counties of Charles City, Chesterfield, Goochland, Hanover, Henrico, New Kent and Powhatan. In working with the team at Senior Connections, I’ve been thinking a lot about how this week relates to me as a younger adult and two big things have really stuck out. 1 – While I’m not really the ‘target demographic’ for this week, I know and love people who are. And if this week can help to inspire or remind some of my friends and family to ramp up their physical activity, that’s worth it. 2 – Maybe this is just another great excuse to get out and be active myself this week. The Maymont Cross Country Festival is coming up and the open 5k would be a great event for my husband and I. Whether you are, feel, or consider yourself “aging” or not – this week plays a role in making our community fitter and healthier. It all kicks off on Monday, September 22nd at 10:00 a.m. at Senior Connections, 24 E. Cary St., Richmond and events run throughout the entire week. Check out Active Aging Week on Facebook to find more. In honor of Active Aging Week, we’ll be profiling 4 Seniors in our area that model active living. All next week we’ll be posting profiles from interviews we did with 4 different Richmond seniors. They’re runners, gardeners, grandparents, musicians, photographers, and retired active living champions.